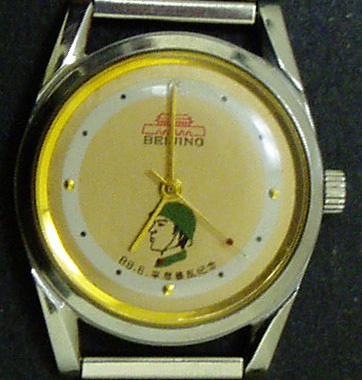 Description: This is a very unique souvenir watch for Chinese People's Liberation Army (PLA) after the bloody incident at Tiananmen Square on June 4th, 1989. This mechanical analog watch was given as a souvenir by the Communist Party Beijing Committee and Beijing Municipal Government to officers of PLA's "Capital Martial Law Enforcement Troops" after June 4th incident at Tiananmen Square. Only a very limited number (probably a couple hundred) were produced. Customer Service Contact: Please send your inquiry to: chinatoday.com@gmail.com.